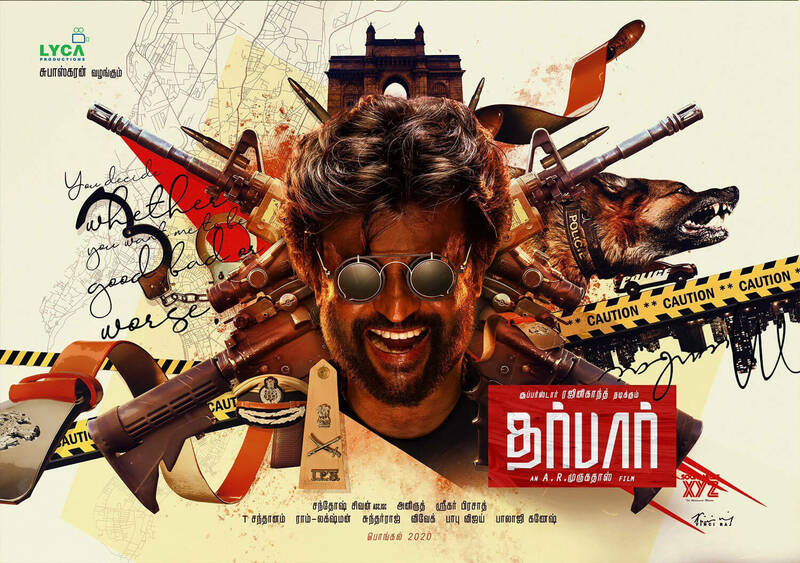 Rajinikanth fans were in for a treat on Tuesday morning—the first look poster of the superstar’s new film, Darbar, was released. Rajinikanth plays the role of a cop in the AR Murugadoss directorial. Darbar is Rajinikanth’s first association with excellent filmmaker AR Murugadoss and it is being financed by Lyca Productions. The poster proposes that Rajinikanth plays a cop, who is playful, sly and of course, sophisticated. The poster features the headshot of a happy Rajinikanth in the backdrop of all cop things. We see an IPS badge, police belt and cap, rifles and bullets, a manic dog with a collar belt that says police, handcuffs, and the yellow tape that is used to keep inquisitive onlookers away from a crime scene. And all these are set against the milieu of Gateway of India, which means the story will develop in Mumbai. Rajinikanth will don the police officer’s uniform after more than 25 years. His last cop role was Pandian, which came out in 1992. And his powerful performance as Alex Pandian from MoondruMugam (1982) remains a favourite cop character. The film, which is expected to release during Pongal, will also see Nayanthara as the female lead. Music will be composed by Anirudh Ravichander, his second collaboration with Rajinikanth after Petta.